Summer at Fleet Pond is in full swing now that our cows have arrived on Wood Lane Heath. The cows, from Miller’s Ark Farm near Odiham, are young males and go by the names Lynx, Lego and Lucas. They are here to do the important job of eating the Purple Moor grass and the birch saplings which if left would take over on the heath to the detriment of important heathland species such as heather. This section of heathland habitat is currently in great condition, as shown in botanical and invertebrate surveys that were carried out last summer which came up with some very positive results. This is largely due to the grazing programme that has been running here since 2004. Grazing is the traditional form of management for managing heathlands and it also reduces the need for manual management. 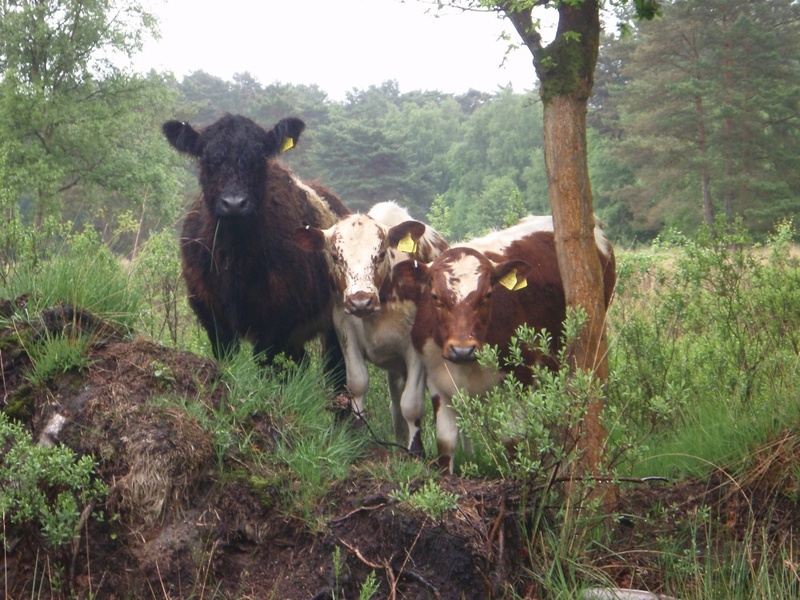 The cows are very used to people passing by, but we ask that all dogs be kept on leads when passing through the heath. There is also plenty of food for them to eat so please do not feed them! We would also like to take the opportunity to say a big thank you to all those “lookers” who keep a close eye on the cattle for us, it’s very much appreciated! OPAL, the Open Air Laboratories network is an exciting new initiative supported by The Big Lottery Fund. OPAL is encouraging people to get back in touch with nature. A wide range of projects is planned. The first survey that encouraged anyone with an interest in nature to participate, in February 2009, asked people to survey the variety of earthworms that could be found close to their homes, in the garden, local park or nature reserve. An OPAL sponsored nation-wide survey started in November 2008 by University College London is looking at lakes and ponds in the UK and Fleet Pond was chosen as representative of lakes in the South East. Water quality, level of siltation, fish species and chemical analysis are all being studied. 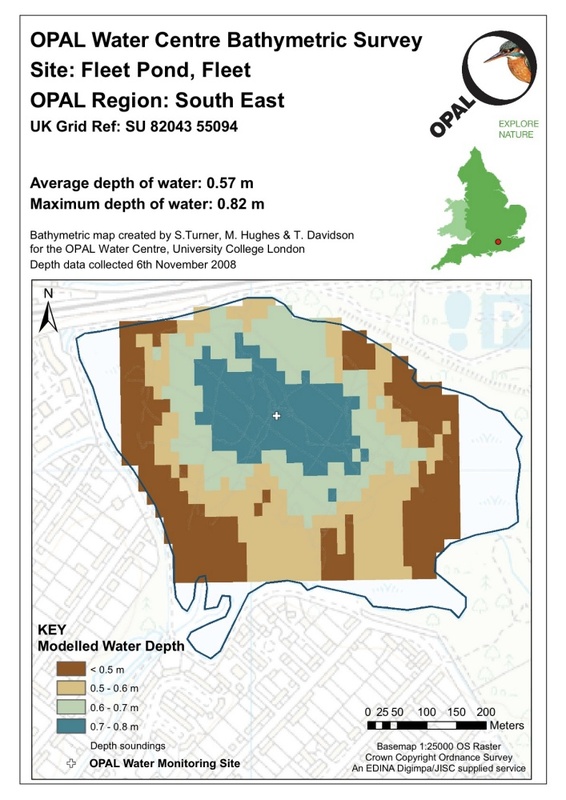 OPAL has produced a bathymetric survey of Fleet Pond which depicts water depths in graphic form (see picture above). This shows very clearly just how serious the silt situation has become. Nowhere over the 52 acres (21 hectares) is the depth more than 0.82 metres. Large areas are less than 0.5 metres. Work to address this situation is urgent if we are not to lose over a third of the pond and to put the nature reserve at risk of losing SSSI notification. To learn what you can do to help or to find more about OPAL visit their website here, send an e-mail here or phone 020 7942 5894. As you know, we are running a monthly series of articles on butterflies (see here and here for the April and May posts). Certain garden plants are magnets. Butterflies visit to drink nectar through a long coiled proboscis (like a drinking straw). In spring, try dandelions and sweet rocket. In summer: buddleia (the “butterfly bush”), scabious, thistles, brambles and herbs in flower like majoram and thyme. Approach slowly. They have all-round vision. Any quick movement will make them take off. If you are lucky enough to live near chalk or limestone grassland, several beautiful and rare species of blue butterfly thrive in short-grazed vegetation. Carry a picture guide or poster. Binoculars can be very useful. Follow a feeding butterfly to where it lands to feed. This sometimes offers a better look at its underside markings, helpful for identifying species like the green-veined white. Three don’ts. Don’t handle caterpillars; they are delicate. Don’t catch butterflies with bare hands; their scaly wings do not regenerate. 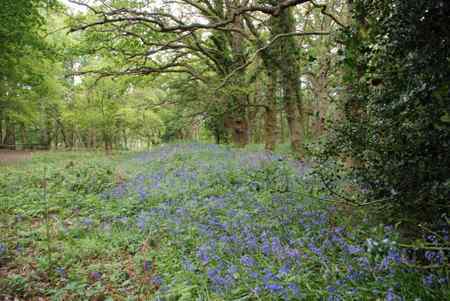 And try not to trample vegetation or wild flowers which may be used for breeding. If you spot a species you can even add a sighting online, see here. The pretty, white flowers of Bogbean have been appearing along the edges of the reedbeds at Hemelite Bay. 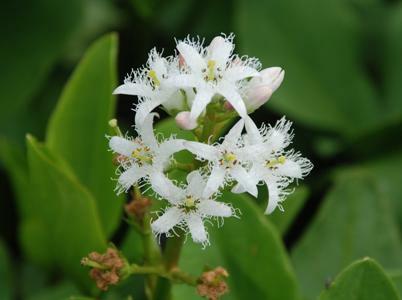 Bogbean is a creeping aquatic perennial that grows along the sides of lakes, ponds or slow-flowing rivers. 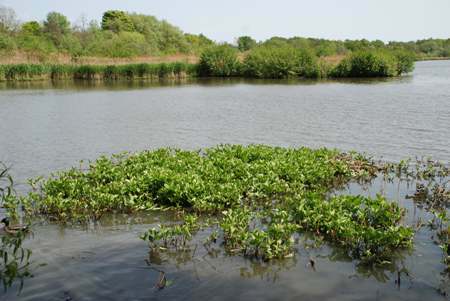 Often forming large colonies, Bogbean plants help to protect the greenery of the reedbeds against damage from Canada Geese. The flower buds of Bogbean are rose-pink and open up into feathery white stars as the petals are fringed with white threads. The plant has distinctive three-lobed shiny leaves raised on long stalks to avoid shade. The leaves of Bogbean have been used to flavour beer, giving the plant the alternative name of ‘bog hop’. 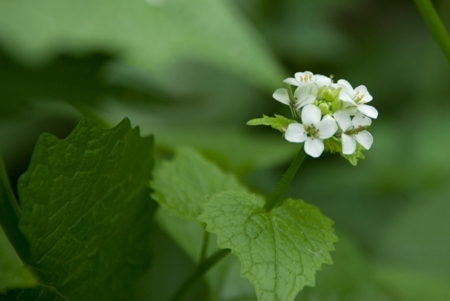 Garlic Mustard, also known as Jack-by-the-Hedge, because of the long lines of white flowers that form alongside hedges in spring, is currently in flower and can be seen at the side of the footpath by the railway. When crushed, the leaves have a distinct smell of garlic, and the flowers attract a large number of moths and butterflies, including the colourful Orange-tip. The dreaded Skunk Cabbage, Lysichiton americanus, has been popping up all around the pond’s margins, originating from the large patch that grows just over the fence by Brookly Bridge. This patch of Skunk Cabbage marks the remains of what was once a private garden that housed other exotic imports, such as bamboo, which can be seen growing vigorously along the stream’s banks. 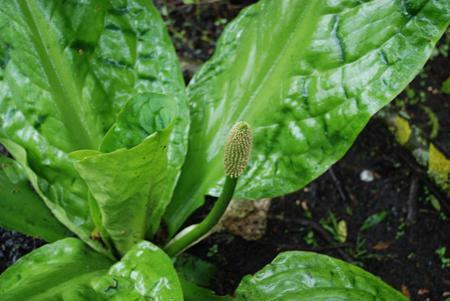 Skunk Cabbage is thought to have been introduced to this country from North America in 1901. A marginal aquatic perennial that grows in boggy areas and shallows, the plant seeds freely and will soon spread the full length of a stream and beyond. Sizeable clumps are now appearing all around the pond; these can cause problems as they shade out other vegetation. Skunk Cabbage is so named because of the strong, musky scent the flowers produce to attract pollinating insects in spring. Its huge green leaves can grow up to a metre tall. The striking yellow flowers that recently appeared are now being followed by knobbly seed heads. For a pleasanter fragrance, try walking along the banks at Sandhills where there are still some lovely displays of bluebells. Next month: Watch out for the tall flowers of Yellow Flag iris which are already starting to appear around the pond. If you have queries or donations, please contact Cathy Holden (phone: 01252 640011 or email here) who will be pleased to help. 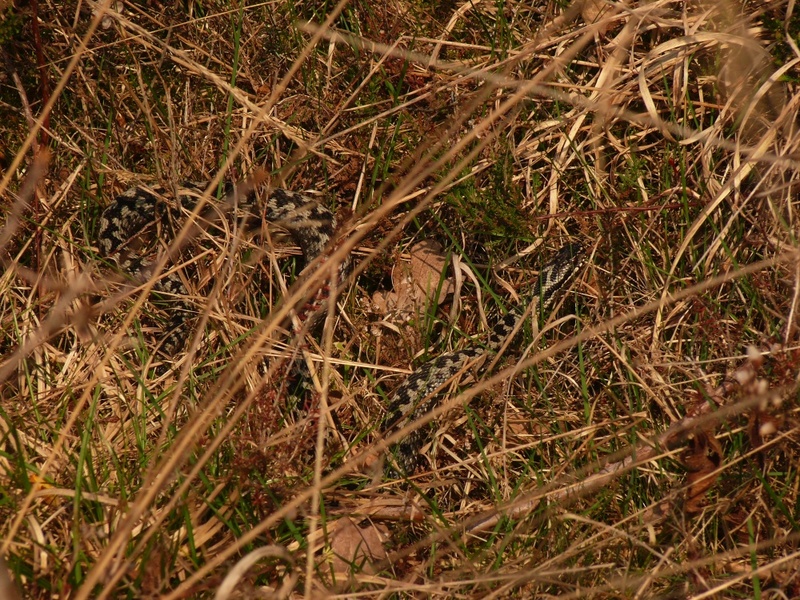 I came across this silvery male adder (above) next to the path through the centre of the Dry Heath basking in the warm sunshine. The males tend to come out earlier than the females, for territory and mates. It is best to keep to the paths, (and dogs on a lead), in the spring, as adders tend then to be slower reacting in avoiding us. In the summer they are much more alert, and can sense us by vibration, hiding away. 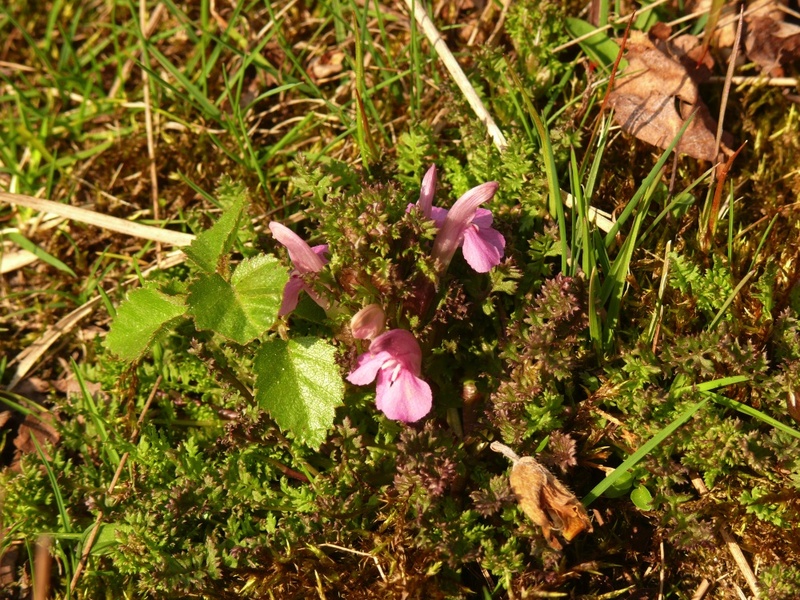 Lousewort (above) is out now beside the path through the Dry Heath to the picnic site. In olden days people used to fill their bedding with this to deter fleas and lice, hence the name. This dragonfly (above) was a surprise being out so early, looking as if it had just hatched from the larva, so was resting, and warming in the sun. They usually inhabit woodland near ponds. 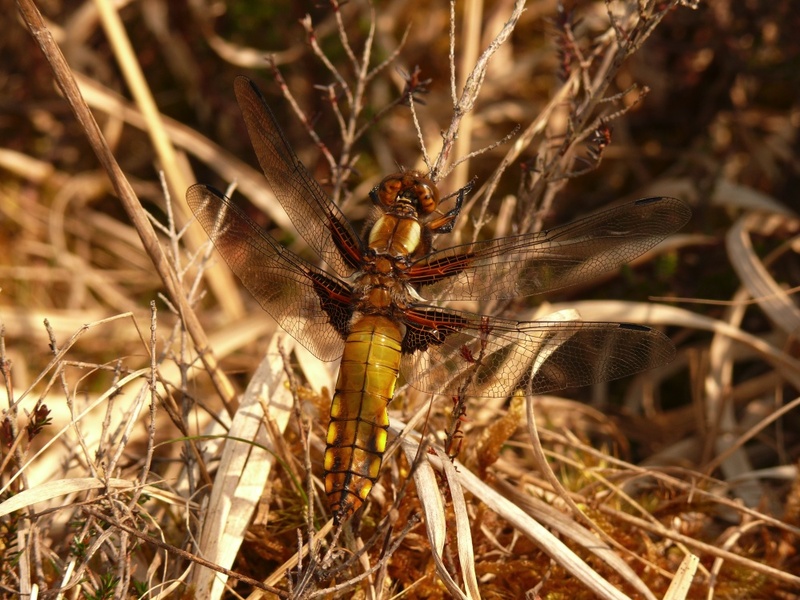 This species, and the Four-Spotted Chaser, (which can be seen in large numbers later, with it’s four bold black spots, whizzing around the scrapes on a hot day), have benefitted from the creation of the scrapes on the marsh, they both like newly created ponds, dragonflies being very specific in their requirements. In case you are unfamiliar with the location of the Dry Heath, please see the Fleet Pond map in the About page above. Last night BBC Countryfile had a section, fronted by Jo Brand and Chris Packham, on their Photographic Competition 2009. The theme of the competition is ‘Wild and Wonderful’ and is open to individual interpretation. The competition entry rules are here. Maybe a suitable shot from Fleet Pond Nature Reserve might make a strong entry? 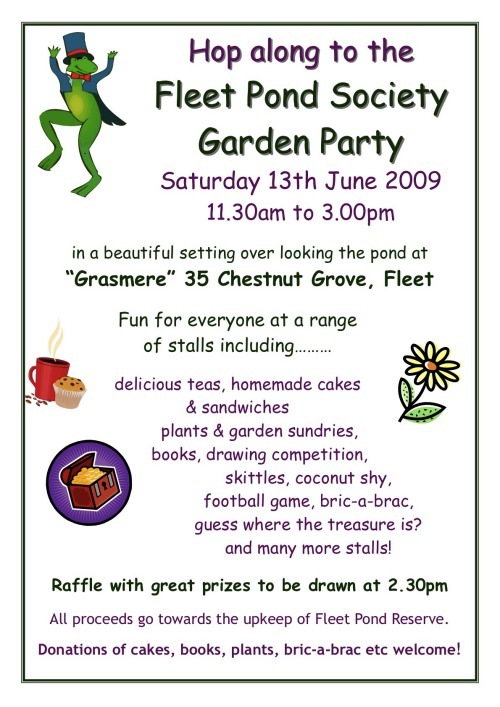 Chris Packham, the well-known TV-presenter, photographer and author, is the Patron of Fleet Pond Society. You are currently browsing the Fleet Pond Blog blog archives for May, 2009.